It’s nighttime. You walk down an empty street by yourself, when suddenly you hear something rustling off to the side. You glance over and see a family of three rummaging through a garbage bin. When they notice they are being watched, they immediately stop and stare back at you until you move on. It’s a family of raccoons and they live off people’s garbage. The next day you come by the same garbage bin again. There is another family rummaging, but this time, it’s three people staring back at you. The place is Isla Vista. Like many other American cities, the college town has not escaped the recent downturn in the global economy. Among the town’s 23,000 residents, eight percent are officially unemployed, while around 10 percent do not have U.S. citizenship or a working permit, according to the 2010 U.S. Census. With conventional job opportunities scarce, many turn to the never-ending flood of empty beverage containers the town can offer. Scavenging, can collecting or “dumpster diving” is a means of survival for some individuals without other sources of income. Among the most frequent collectors are undocumented immigrants, students and homeless people looking to supplement their income, a county official said. They use strollers, trucks and bike trailers to gather what the college town deems disposable. Annette Pinto, a formerly homeless woman, said she has collected bottles for two years. Rummaging through IV’s garbage, the 42-year-old, who dreams of owning a café, has managed to get herself off the street. After she finished high school in New York, Pinto said she became self-employed and traveled across the United States in her trailer. When she reached the Pacific, she found herself with empty pockets. “When I arrived in San Diego, I had no savings, and so I officially became homeless,” Pinto said. Broke and without any job opportunities, Pinto moved to IV in early 2010 and became a bottle and can collector. “A friend told me about the recycling opportunities and I would fit in here since I’m independent,” Pinto said. IV is an ideal place for scavengers like Pinto, according to Carlyle Johnston. He is the project leader for the Santa Barbara County Recycling and Waste Management Division, which aims to increase the county’s recycling rate. The weekly beer sales at Keg-N-Bottle, IV’s biggest alcohol retailer, roughly equals 5,600 beer cans, according to a K’n’B store clerk. The town’s everlasting thirst has resulted in what Johnston called a “trash problem.” He referred to the massive amount of broken glass on the street, empty cans on the beach and in the bushes and overloaded dumpsters that one witnesses when walking down the streets of IV. Pinto and other collectors make money off recyclables by taking them to the town’s only buyback center. The owner, Tomra Pacific Inc., pays collectors the California Redemption Value in exchange for cans and bottles. The gathered recyclables are then refined, reprocessed and finally sold abroad, according to William Campbell, who works at the IV buyback center. “The buyback centers are an incentive for people to recycle their own trash,” Campbell said. In the recent past, the California Redemption Value rewards have attracted a larger number of people to collect. “Ever since the economy has gone downhill, I have seen a huge increase of undocumented collectors, especially from Central America,” Campbell said. In light of new undocumented immigrants, Pinto saw her income dwindling. “I used to make 40 to 60 bucks a day, but suddenly it was only about 25 bucks,” she said. Pinto pointed to IV’s low recycling rates as the cause of her dumpster diving. “I’ve gone through each one of these dumpsters and nobody is recycling,” she said. “Many students don’t care about recycling because they know that the bottle collectors will do it for them,” he said. The service provided by IV’s collecting community not only helps local residents, but also the global environment. In one week, the collectors take roughly 1000 pounds of aluminum to the Tomra buyback center, according to Campbell. Recycling only 2.2 pounds of aluminum saves 17.5 pounds of bauxite, the raw material out of which aluminum is gained, 8.8 pounds of chemical products and 14 KW of electricity, according to a study conducted by the Transylvania University of Brasov in Romania. No wonder that IV’s collectors are sometimes referred to as “can fairies.” But often times, these fairies lack legal documentation, like Augusto. Born in Oaxaca, he is one of the Mexican immigrants who, according to Pinto, dominate the local collecting business. Like many other seniors, the 82-year-old came to Southern California to enjoy his old age. Augusto said he illegally entered the United States in 2004. Before that, he was working on a Mexican farm until his employer was driven out of business. Augusto is only one among an estimated 12 million illegal immigrants who live from hand to mouth on American soil, according to a Princeton study. 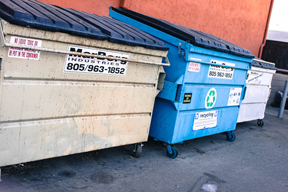 Another helpful change for collectors and the recycling effort, according to Pinto, would be for the county to replace the recycling bins that comingle paper, plastic and cans with individual bins for each specific recyclable. It seems that in a community where recycling has become a means of surviving for some residents, the safety of the scavengers is not the authorities’ first priority. With largely indifferent local residents and authorities, all IV’s can fairies can hope for is the recovery of the global economy, or reforms of policies, like NAFTA, that resulted in many Mexicans losing jobs in their own country. Regardless, Augusto and other IV’s bottle collectors are still out there, cada día, trying to survive on what residents have thrown away. And when the scavengers rest, the town’s trash might belong solely to the raccoons. Annette Pinto has found a home—through recycling. Although she seems happy about her own fate, she doesn’t see a bright future for America. “If things don’t change in this country, it’s not going to be uncommon even for Americans to be digging through other people’s trash,” Pinto said.